Nicky VanValkenburgh wrote "Train Your Brain, Transform Your Life" after experiencing a remarkable personal transformation with brain training for ADHD. Her book reveals a powerful remedy for ADHD that was discovered in 1968, and is currently used in neurotherapy clinics across the country. It’s also a remedy that you could practice in the comfort of your own home, without ever stepping foot inside a clinic or spending a time on gas. Nicky is a motivational writer with 20 years experience writing for newspapers and magazines. She has a Master's in Journalism and a Bachelor's in Psychology. She is a contributing writer for Upstate Parent, Low Country Parent and Palmetto Parent magazines, which are published in South Carolina (circ. 250,000). Occasionally, she also writes for the American Chronicle and California Chronicle. I have people from every field and discipline on my radio show. They are brilliant and compassionate. They rewired their brains and now rewire others' brains. Nicky Van Valkenburgh does this in Train Your Brain, Transform Your Life. Her book will do major rewiring of your brain. Nicky begins with why she began ALERT training to deal with ADHD. She then gives you the many reasons why it works, based on her thorough research and the history of how the program evolved. It is a manual to guide you through your own struggle with ADHD and similar problems. Parents, teachers, and employers dealing with those with ADHD symptoms will find effective answers. Teachers can use the ALERT program for themselves. For their ADHD students, Nicky explains how it can be used with different programs to deal with different Sensory Motor Rhythms. Her book is organized perfectly with a blend of scientific explanations, charts, and personal letters that keep you interested and engaged. It is a teaching and learning tool written by a fine writer. 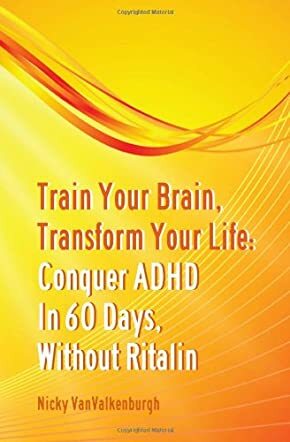 It does everything she promises for ADHD people, but it has potential for anyone who wishes to learn how to consciously go into the proper brain wave pattern to meet specific needs.